University of Toledo freshman Maison Hullibarger killed himself on Dec. 4. He was 18. 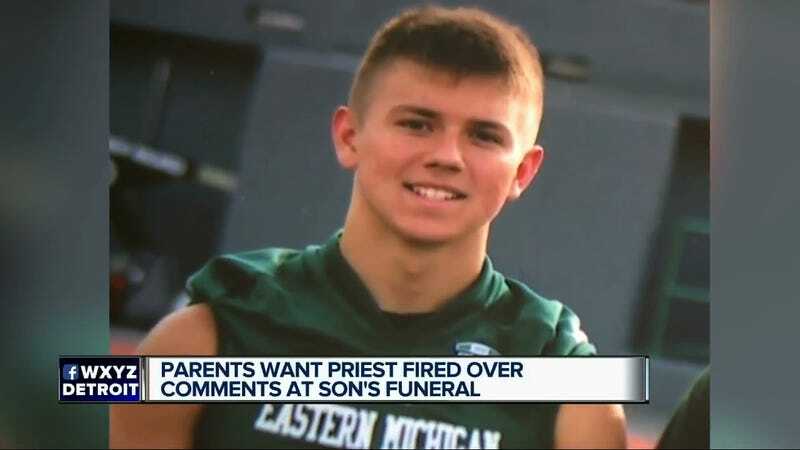 Hullibarger’s Dec. 8 funeral in Michigan was spoiled by not only the Catholic priest overseeing the service, but his former high school football coach who wasn’t invited. Quite a team effort. “We wanted him to celebrate how Maison lived, not how he died,” Maison’s mother said. Instead, when LaCuesta gave his homily to hundreds of mourners and family members, “It was his time to tell everybody what he thought of suicide, (and) we couldn’t believe what he was saying,” Maison’s father said. “He was up there condemning our son, pretty much calling him a sinner. He wondered if he had repented enough to make it to heaven. He said ‘suicide’ upwards of six times. “There were actually a couple of younger boys who were Maison’s age who left the church sobbing,” Jeff Hullibarger said. The bereaved father at one point walked to the pulpit and whispered to the priest, “Father, please stop,” but their pastor continued with statements denouncing the way their son’s life ended, the couple said. The Archdiocese of Detroit apologized to the family in a statement to the Free Press. “For the foreseeable future, [LaCuesta] will not be preaching at funerals and he will have his other homilies reviewed by a priest mentor,” the statement read. “We’ve had four boys who played for him. He’s been bullying kids for many years,” Jeff Hullibarger said. His wife said she messaged through an intermediary that Wood was not welcome at the service. “We knew Maison would not want him at his funeral. He did not treat Maison kindly. So it was our wish that he would not be there,” she said. If you or someone you know is having suicidal thoughts, call the National Suicide Prevention Lifeline at 800-273-8255.